Above: Freedom of the Seas docking at the Port of Miami. If you were driving over the MacArthur causeway this morning, you may have run into some traffic. People were pulled over on the side of the road taking pictures and a helicopter was flying overhead. 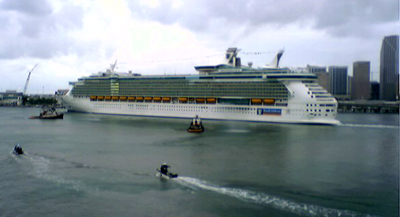 Royal Caribbean’s new Freedom of the Seas was docking for the first time at the Port of Miami. The cruise ship holds the record for the largest in the world, weighing 160,000 tons and capable of holding 4,375 passengers. Freedom has more activities than any other ship with a wave pool, boxing ring, rock-climbing wall, an ice-skating rink, a full-sized basketball court, a sports pool, and the largest gym on the seas. Cruise ships are being made as a destination unto themselves. The photo above was taken with my new Verizon LG VX8100 VCast camera phone. I’m just getting used to how it works. This is the first picture I sent to my computer. Michelle Moore is the Miami tours and transportation expert who founded Miami Beach 411. To schedule service, book online or call Michelle at (305) 754-2206. See more articles by Michelle. "Freedom of the Seas Docks in Miami"
Please advice how and were to park a camper van for one week while cruising. Hi Walter, I suggest parking at Bayside Marketplace in Downtown Miami. The cost for a regular size vehicle is $10 per day. From Bayside, a taxi to the Port of Miami should cost about $6. To find pictures and directions, go to the bottom of this page and search [Bayside Market].